International Baseball executives have posthumously inducted legendary University of Southern California and U.S. Olympic Baseball Team coach Rod Dedeaux into the IBAF Founders Club. LAUSANNE (SUI) -- International Baseball executives have posthumously inducted legendary University of Southern California and U.S. Olympic Baseball Team coach Raoul Martial "Rod" Dedeaux (1914-2006) into the IBAF Founders Club, which includes Masato Mizuno, Peter O'Malley and Sadaharu Oh. Members of International Baseball's Executive Committee unanimously approved to honour and recognise Rod Dedeaux's pioneering vision and enduring legacy on baseball's sustained globalisation, and his leadership and key involvement at critical stages that helped elevate baseball onto the Olympic Games platform. "This honour recognises that Rod Dedeaux's legacy not only had a major impact on amateur baseball in the United States, but also paved the way for the multitude of international competitions around the world," said USA Baseball's executive director/CEO, Paul Seiler. "We are proud to have one of the great ambassadors of Team USA join this prestigious club." As a young volunteer at the 1932 Olympic Games in Los Angeles -- six years before the founding of the International Baseball Federation -- Dedeaux envisioned the sport of baseball within the programme of the Olympic Games. Thirty-two years later, Dedeaux would be responsible for assembling the U.S. Olympic Baseball Team that participated at the 1964 Olympic Games in Tokyo while baseball was a demonstration sport. Dedeaux then founded the USA-Japan University World Series in 1972. Throughout his career, Dedeaux helped to spearhead the development of baseball internationally and was instrumental in the inclusion of the first Olympic baseball tournament at the 1984 Olympic Games in Los Angeles, where he also coached the U.S. Olympic Baseball Team to a silver medal in Dodger Stadium. In 1986, following evaluations of the 1984 Olympic Games, the International Olympic Committee approved baseball as an official medal sport starting with the 1992 Olympic Games in Barcelona; baseball remained on the Olympic Programme through the 2008 Beijing Olympic Games. "Rod Dedeaux was a true pioneer in the growth of international baseball. With his many friendships worldwide, Rod played an integral role in the IOC's approval of baseball as a gold medal sport in 1986. I was fortunate to have worked with him on numerous occasions, witnessing first-hand his love of the game," said Peter O'Malley, president, Los Angeles Dodgers, 1970-1998. WBSC co-President/International Baseball President Riccardo Fraccari commented on the lasting legacy Rod Dedeaux helped create and the decision to honour him. "Since the Olympic Games in 1984, baseball's global footprint has more than doubled in size -- going from 54 countries, in terms of National Federations, to over 120 countries worldwide," said Fraccari. 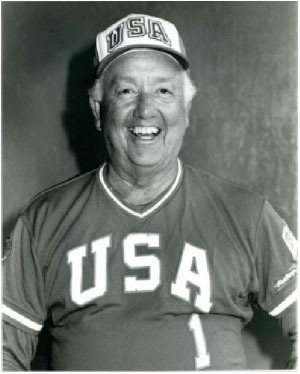 "Baseball's international prosperity, as we know it today, would not have emerged without the lifelong contribution, inspiration and global vision of Rod Dedeaux -- a true baseball ambassador who recognised the power of the Olympic Movement and helped make baseball a part of it. "The International Baseball Executive Committee fully recognises this and feels that it is an honour and duty to have the late Rod Dedeaux as an eternal member of the IBAF Founders Club -- and we are committed to furthering his vision and preserving his legacy." Dedeaux served forty-five years as head coach of the University of Southern California's baseball programme, where he guided multiple generations of young student-athletes, built baseball's brightest stars and won a record 11 national championships with USC. Dedeaux was named "Coach of the Century" by both Baseball America and Collegiate Baseball. In 1996, he was honoured by the Japanese Government with the Fourth Order of Merit-Cordon of the Rising Sun award. The Rod Dedeaux Foundation was formed to continue Rod's spirit by supporting youth baseball and softball programmes in underserved and socio-economically challenged areas. A life-size statue of Dedeaux was erected at USC's Dedeaux (Baseball) Field on the 16th of February 2014 -- the eve of what would have been Rod Dedeaux's 100th birthday.